My adventures with my new dehydrator continue. It’s a roller coaster ride, but I’m persevering. The bin men might start to complain about the weight of soggy, putty-smelling residue they have to cart away each week, but I’m determined to make this work. Dehydrating doesn’t chemically transform the flavour in any way, like baking does. So, if the raw dough tastes like crap, the end result will be a hard biscuit that tastes like crap. Things called ‘crackers’ need drying very thoroughly indeed. They need to spend many more hours in the dehydrator than I’ve been giving them. 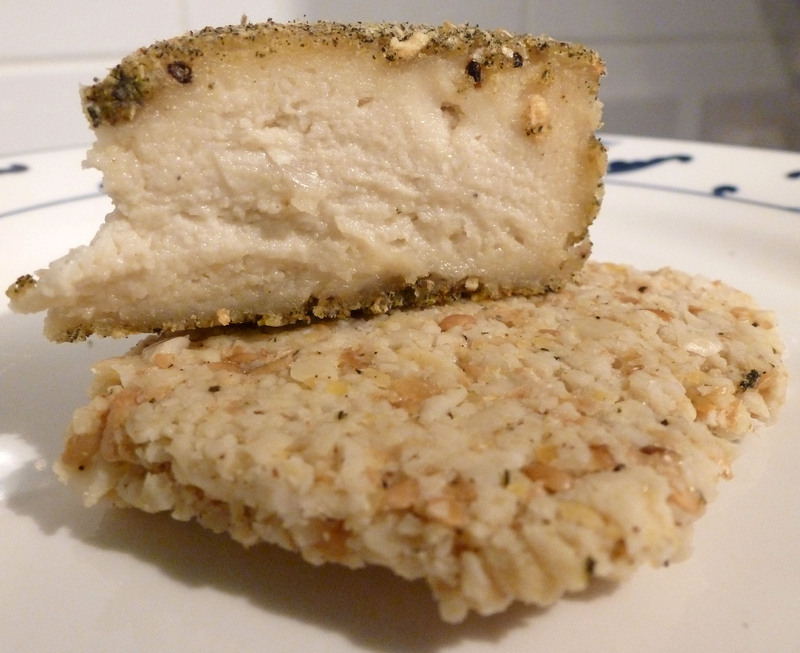 For the Sage and Onion cheese, I used the Simple Almond Cheese recipe, but substituted cashews for the almonds. I dried an onion, sliced, and a big bunch of sage, then ground it to a fine powder with a dozen black peppercorns. I rolled the cheese in this to coat it, then dehydrated it for 6 hours to give a crust. It’s interesting that the cashew nuts hung on to the added water/olive oil/lemon juice in the way the almonds don’t in the original recipe. I drained the mixture in a cheesecloth for 24 hours, but it threw off absolutely nothing, where the almond cheese drips a couple of tablespoonfuls of fluid. This contributed to it being really light and creamy. Yeah! I’ll make this combo again! I’m enjoying experimenting with my new dehydrator. 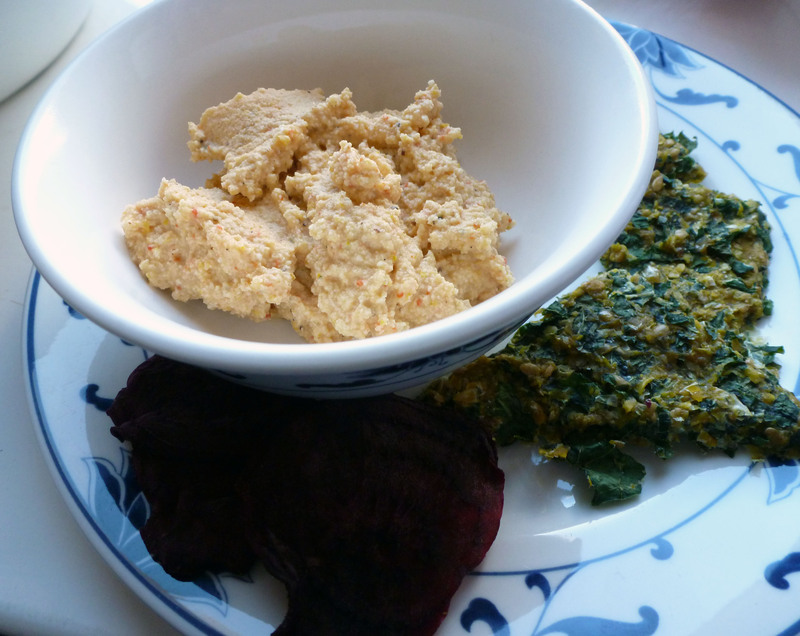 Kale and cashew crisps are great, and I enjoyed having my Hazelnut Cranberry Flatbreads topped with cashew butter and banana for breakfast all last week. But when things go wrong, I’ve discovered there is nothing more disgusting than a dehydrated accident. Below on the left we have the delicious Pear and Walnut crackers. 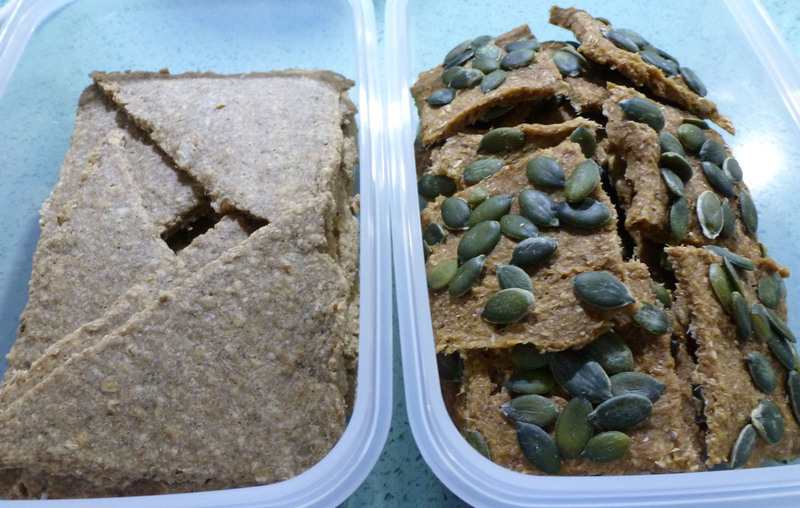 On the right, the absolutely vile Pumpkin Seed crackers. Appearances are deceptive. They look yummy. In fact, when you start eating one, the initial taste is acceptable, but, as you chew, it turns into something really bitter and grassy. The final impression is of chewing matted hair you’ve rescued from the bath plug hole. I’m identifying sprouted wheat berries as the culprit. The last recipe I made with them was vile, too, but I thought that was because the batch had gone ‘off’. It’s a shame because the wheat takes ages to soak and sprout, and is supposed to be amazingly good for you. Even so, I’m going to have to add them to the very short list of foods I can’t eat without retching (the other one being skin on rice pudding – easy to avoid). Hubby and I found we were accidental vegans on Sunday. No we didn’t get pointy ears – that’s vulcans – we just didn’t get round to eating any meat. I made some beetroot crisps and some Corn Kale Chips. I served them with guacamole and my new invention, Almond Pepper Dip. The black things at the bottom are beetroot crisps. The corn kale chips have a healthy portion of flax seed in them, so more estrogen-busting compounds. After we’d scoffed that we didn’t have room for the chicken stir-fry I’d planned. Plus we’d had about 12 of our 5-a-day! *Flavouring: I dried 1 yellow bell pepper and half a red bell pepper in my new dehydrator and ground it to a powder (home-made paprika, I guess). It would have worked as well with a couple of heaped teaspoons of paprika, or possibly a pepper that had been grilled to blackness and then skinned. Put everything into a food processor and whizz until smooth. Be careful with the water! It’s easy to make it too runny. Start with 1 tbsp and add more as required. 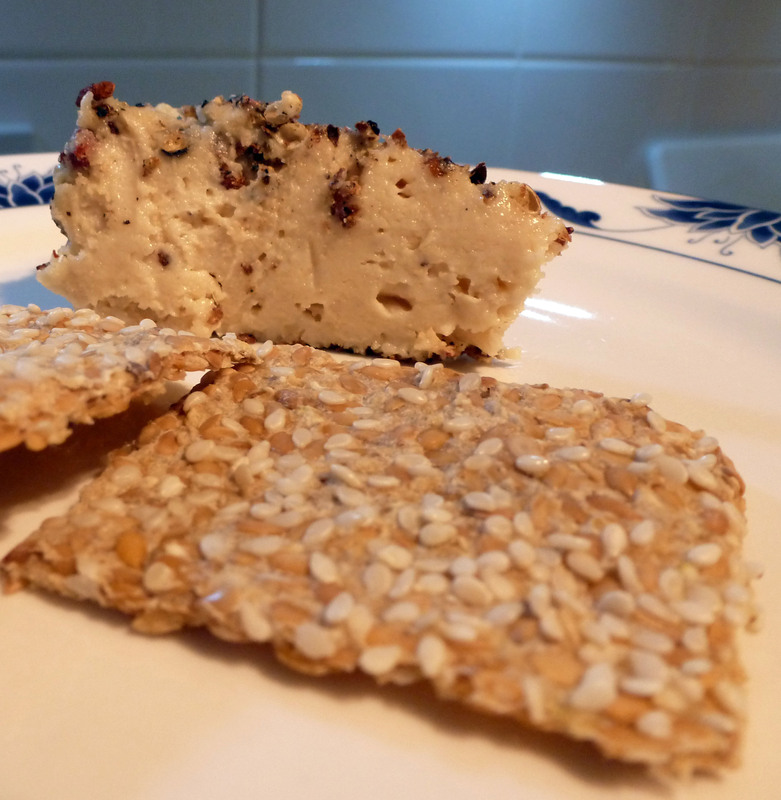 After a week of wild culinary experimentation here at Laboratoire Squires, involving soaking, sprouting, fermenting, whizzing and drying, I’m pleased to announce a moderate success – Cashew cheese with Sesame Flax Crackers. The amount of work involved does make you wonder if it wouldn’t just be easier to go and buy some peanut butter and a pack of crispbreads, but it IS tasty. There have been some disasters though. Real smelly ones. My dehydrator broke down and I had to get a replacement sent to me, so a batch of ‘Onion Flax crackers’ went horribly wrong. When I got my new dehydrator I carried on trying to dry the damn things out, but by then they had become a rancid mix of oxidised onion and window putty. They smelled so bad I not only had to get them in the bin, but right out of the house. Why am I bothering? Just trying to add a bit of interest to the anti-cancer ‘Bristol Diet’, and increase my intake of plant-based foods. Flax is supposed to stop estrogen binding in estrogen sensitive cancers – like mine – so I’m trying to get more of that in my diet. Not easy, it being a rascally, putty-smelly seed. Still, when I pop my clogs you’ll be able to put in a house full of windows with me.